Images of Surya, the Vedic sun god, typically depict him standing in front of a solar aureole, with both hands raised, holding a lotus flower. Here, Surya is accompanied by his large retinue, which includes his two wives, Rajni and Nikshubha, two smaller male attendants, Dandi and Pingala, along with other celestial figures. A female figure, perhaps the earth goddess Bhudevi, stands between his feet in a spot usually reserved for his charioteer, Aruna. 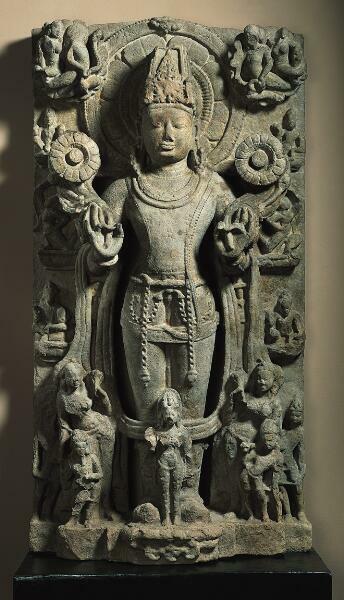 The absence of Aruna and the presence of the female figure both suggest that this sculpture was made in Uttar Pradesh. Sun worship in India goes back thousands of years. And verses to Surya, the Hindu sun god, appear in the earliest Indian body of literature, the ancient Rig Veda, written about 3500 years ago or earlier. Until the 13th century, Surya had major temples built in his honor across the northern part of the subcontinent. He still plays a role in modern Hindu ritual and, as the leader of a group of nine planetary deities, he is venerated by Buddhists and Jains too. You can identify Surya by the two fully open lotus blossoms he holds, symbolizing his life-giving functions. Flanking him are his spouses, also grasping lotuses. The smaller males standing in front of them are Surya’s attendants. Beside Surya’s hands, on the slab behind him, are kneeling goddesses shooting arrows—named “the dawn,” and “pre-dawn.” They dispel the demons of darkness with their weapons as Surya rises. This large sculpture is a lintel, an architectural piece originally positioned above a door of a shrine. Though the lintel is very worn, its subject matter is fascinating—one of the most famous Hindu creation myths. In the center is the god Vishnu, the preserver of the universe, reclining on the serpent king Ananta. Ananta, whose name means “eternity,” floats on the waters of the infinite cosmic ocean. As Vishnu emerges from his yogic sleep, a lotus stalk sprouts from his navel, and Creation begins. The heart of the lotus flower reveals the god Brahma, who creates a new world. At the end of time, Creation dissolves in a blazing inferno, and its ash, containing the potential for all forms of life, disappears into the cosmic ocean. The ocean rests; Vishnu sleeps. Then he awakens, and the cycle is once more set in motion. Here, Vishnu is just waking up, protected by a canopy of Ananta’s five heads. He rests his head on one of his four arms while his wife Lakshmi massages his legs. In the center of the relief, above Vishnu’s arm, are the remains of the lotus that carried the god Brahma. Behind Vishnu and Lakshmi, lotus stalks and buds sway gently in the wind. Such beautifully rendered details give us some idea of the excellent original quality of the carving.